A Hispano Ha-200 Saeta crashed during an airshow in Madrid, killing the pilot, and injuring several bystanders. The causes of the accident are unknown at this time. The pilot was 35-year old , Ladislao Tejedor Romero, an experienced military pilot and assistant to the Spanish Defence Minister. Romero died from burns suffered in the crash after he was admitted at Getafe hospital. The aircraft was the Ha-200 Saeta EC-DXR, which is well known by Spanish aviation enthusiasts and spotters. The aircraft was built in the 1950s and was operated by the Fundación Infante de Orleans. A video posted on YouTube shows the Saeta engaging in a Split-S and not recovering, and crashing into a building. 203 Training Squadron, at Moron AB as “50”. *1/1980: Withdrawn from use and sold on the civilian market. 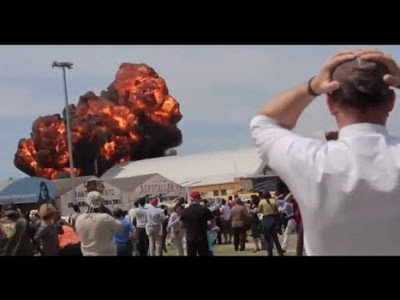 Written off in accident as airshow, killing pilot 05.05.2013. The HA-200 Saeta (Arrow) was the first Spanish turbojet aircraft. 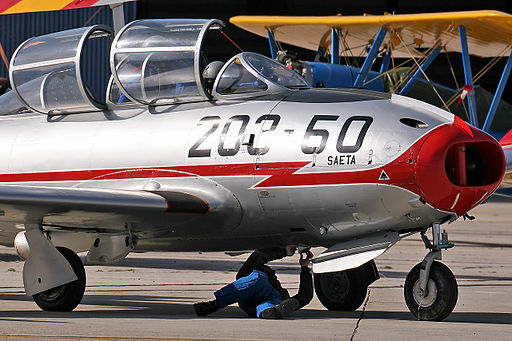 It was designed by Willy Messerschmitt as the earlier piston-powered trainer HA-100 Triana. The HA-200 was a low-winged monoplane of all metal construction, with a tricycle undercarriage. 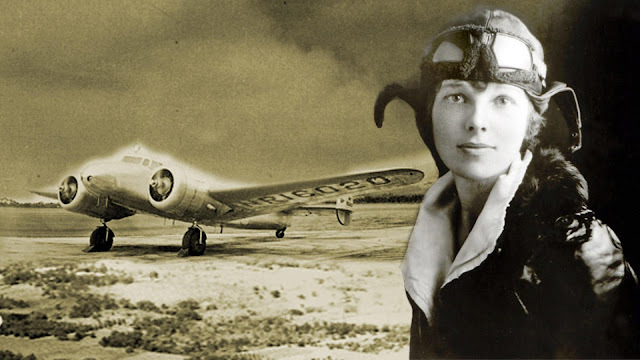 It was powered by two Turboméca Marboré mounted side by-side in the forward fuselage and fed from an intake in the nose, exhausting from nozzles just aft of the wing trailing edge. 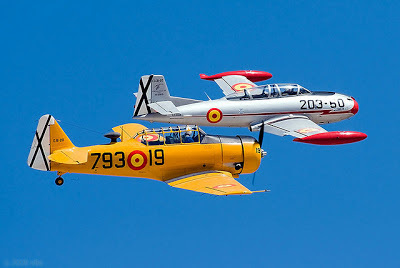 The crew of two was accommodated in tandem in a pressurized cockpit, the first to be Spanish built and designed. The prototype first flew on 12 August 1955, and the first production aircraft flew in October 1962. 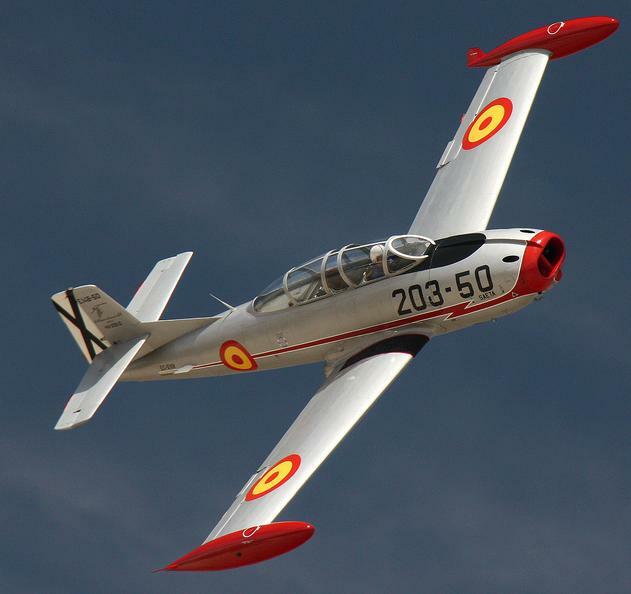 The HA-200A aircraft were delivered to the Spanish Air Force with the designation E.14. 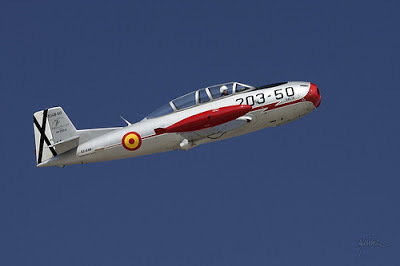 A single seat version (the HA-220) for the ground-attack role was developed and delivered to the Spanish Air Force with the designation C.10, first flying on 25 April 1970, remaining in service until the end of 1981. The aircraft was built in Egypt under license as the Helwan HA-200B Al-Kahira by the Helwan Air Works. Engines: Two 1,058-pound thrust Turbomeca Marbore VI turbojets. Weight: Empty 4,453 lbs., Max Takeoff 7,937 lbs. Wing Span: 34ft., 1.75 in. Maximum Speed: 430 mph at 23,000 ft.
Armament: Under-wing hard-points for a variety of weapons; 20-mm cannon in nose. Number Still Airworthy: Approximately 15. Combat report: In 1970, the HA-200 replaced the aging CASA-built Heinkel He-111s in Escuadrón 462 on the Canary Islands. From there they flew on detachments to Spanish Sahara. 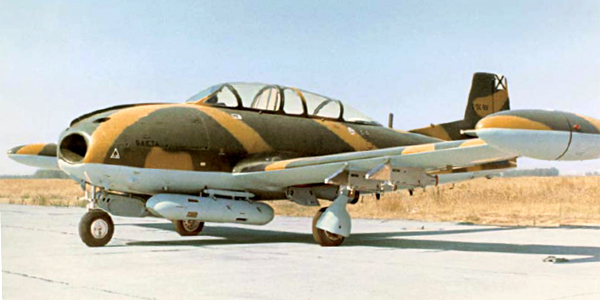 Late in 1974, during the Polisario uprisings, the planes flew their first combat missions. Polisario guerillas ambushed a police patrol from higher ground and caves, and held them pinned from their protected positions. Several T-6Ds with machine guns and a couple of UH-1 helicopters strafed the Polisario positions but with little effect. Very soon the first two Saetas arrived with 2.75" FFARs. Diving at a 45 degree angle toward the cave entrances, the stability of the HA-200 design proved itself without a doubt, as the rockets were observed flying straight into the caves. Following the initial rocket attacks, ground troops attempted to take the caves, but were pushed back. The next morning, the Saetas arrived once more, in the company of more T-6s and UH-1 troop carriers. The attack pattern from the previous day proved itself once more, with a FAC ordering fire where it would be most useful. Rocket after rocket entered the caves through the 5-10 foot entrances, with very few missing their target. It seems one of the rockets set off some mortar rounds, as there were several very large explosions. Soon, ground troops once again attempted to take the caves, but this time there was hardly any resistance. Most of the guerillas had been killed by the accurate rocket fire delivered by the Saetas.